Please feel free to bring your questions, comments, complaints, etc. Just abide by the forum rules please. The biggest advice I have in the early stages is to pick only 2 categories and focus on those. If it's like the previous one, the rewards will be better if you take a category all the way to 10 instead of spreading out your achievements across multiple areas. Thank you Cthulu excellent post as always. I think there is a lot of players that don't know you only have to pick 2 categories and stick with it. Anyone has any input for Battle Points? I am thinking to do that for 2nd category to collect, but I have no idea how high it will go. Gonna wait till last wars, anyway. This would be a great implementation. 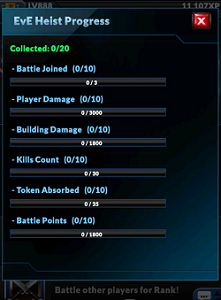 I understand not showing the level you are currently on, but a total damage/battle points/joined wars, etc would be great to be shown, even if you went over the requirement. Last edited by alexian; 05-12-2017, 12:33 PM. It has been like that since last EvE heist. Its a feature not a bug ;D.
Thats why you should focus on 2 categories for max rewards. Why can one collect only 20 rewards from the heist event ? Is this the event rule or some kind of error ?